Yet another storming gig. Or so people say. Thanks to Jochen Upheber (MERCYMAN@t-online.de) and lepi@uni-muenster.de for main setlist, Tobias Dorf (heartwork@wtal.de) for soundcheck. 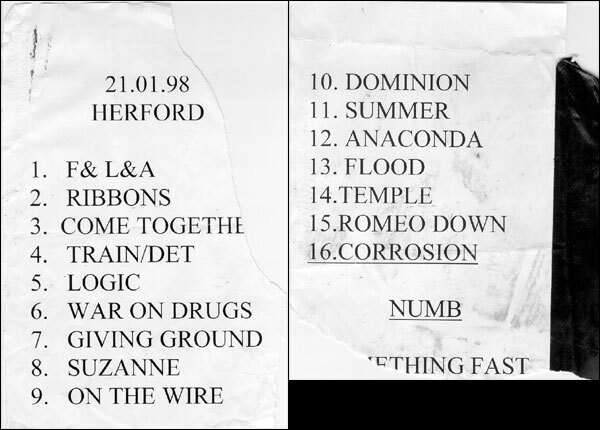 Setlist scanned by Jochen Upheber. The Herford gig was indeed very good and I wouldn't ad anything to the previous description, just something about the pre-show bands. Scoda Blush were boring like hell and I'll never understand why bands like these get record contracts. Second on were Think About Mutation who were much better than I thought they'd be. Though it looked like they were a bit too "alternative" for the greater part of the audience. To be honest I couldn't understand why people didn't start dancing during their set. Usually the whole floor looks like a whirlpool when they're on stage and once again they did a great show. They're a lot softer than a short while ago and even more enjoyable. While listening to the new songs I thought for a moment: If the new album is going to be like this you can listen to it while you're doing your washing-up but Summer changed my mind a little. If the album's more like this there's still some hope. "Get your elbow from my girlfriend's neck"
"I can't see anything, they should make all the people sit down"
"Why can't you keep your hands down, this is disturbing me"
In my opinion the Herford Gig was a very good concert. The light show was again fascinating. I had some doubts if Andrew would really push his voice to the top because of the three concerts in a row (Berlin, Herford, Düsseldorf). But the songs were brilliantly sung by him, especially Comfortably Numb. The band played 20 numbers and also seemed to enjoy the gig. After the show, I had the possibility to have a conversation with Adam and Mike and they confirmed that it had been the best atmosphere so long on the current tour. Although it was already late last night, I took the time to read some articles of Glasperlenspiel 01. I must admit that I really enjoyed reading some intelligent comments on our favorite band. A big thank you to the writers, designers, photographers, the editor -- especially to those who I know from the Dominion list, Chris, Ian, Dr. C, Wim... Losing UtR also meant losing the opportunity to communicate with other Sisters fans. So again big thanks to you for your attempt to keep this 'old' spirit alive. First, I'm proud to have seen the new Sisters in a little club like the Kick in Herford. It was a great party. About the "pre-bands": Scoda Blush played melodic rock, something between brit-pop and Pearl Jam. Think About Mutation made lots of noise, but very boring. The new stuff was nice, especially the speeding up "War on Drugs" - funny to place it after "Logic" by the way - and "Romeo Down", which AE called "the mistery-song". All of them are good to looking forward in great hope for the new Sisters output. I have missed "Alice", "Marian" and "More", but nervermind. The Sisters are back from hell to give us what we deserve! Ticket scanned by Jochen Upheber (MERCYMAN@t-online.de).